For this month's "Maps Of The Month" featurette, I wish to draw your attention to Paco & Tropicon's Mystic Ark (J) (Super NES) maps. Awakening in a temple on Goddess Island, you are tasked with retrieving arks scattered across different worlds. Adventuring through those worlds and collecting all of the arks will allow you to open a door in the temple to reach the Nexus of Darkness, and by defeating the evil there, you will be able to return home. Mystic Ark (J) features a number of distinct worlds, each with their own stories, so it's been referred to as a collection or an anthology of adventures, with Goddess Island being the hub and the central point of the overall narrative. Each of the unique settings - from villages in giant fruit (Fruit World) to a world that's just a haunted house (Dark World) - has been thoroughly mapped and labelled by the mapping team of Paco and Tropicon. Have you ever seen a world map with more space dedicated to the text than the actual map? It's an incredible amount of information to behold, and deserves recognition especially considering that being a Japan-only game, its obscurity makes the effort put into it that much more impressive. 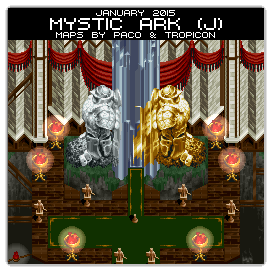 So to recognize the effort put into mapping an obscure game with such zeal, Paco & Tropicon's Mystic Ark (J) (Super NES) maps will be known as VGMaps.com's Maps Of The Month for January 2015. Yeah! Thanks for the honor Jon this was a fun and difficult project. To anyone who hasn't played this game go do it now. It was one of the last cool twisted reality games Enix made before Square essentially destroyed them. Mystic Ark is a strange sequel to both The 7th Saga and Brain Lord. Characters, monsters, and design from both predecessor games are incorporated into this one. Some people might not like the bizarre world hopping but the game still has all the RPG mechanics found in others like it of its day. And of course like other Enix titles it has that distorted quality that keeps it from feeling rigid or like "just a game". As for the work Paco and I did it too was fun. There was a lot of discussion on what to put where. We had to create special arrangements and visual puzzle solutions. Sometimes the challenges were frustrating, but they were always satisfying of overcome. It was like building a giant LEGO tower with video game blocks. Totally fun, totally worth the effort. I'd totally do it again.